DOVER, Del. -- An alleged drunk driver struck seven people during homecoming at Delaware State University, police say. Just before 7:30 p.m. Saturday, Dover police say 28-year-old Gregory Ligon of Mitchelville, Maryland, was driving a Mercedes Benz sedan in the area of a fraternity picnic area. Police say Ligon attempted to park his vehicle in the area and exited. Once he did, he realized the car was still in reverse. According to police, Ligon quickly went back in the driver's seat to stop the vehicle and pushed the gas pedal instead of the brake. The vehicle accelerated over a curb and across a grassy area full of people with its driver side door open. The vehicle struck a total of seven people including a 51-year-old male from Philadelphia, a 20-year-old female from Egg Harbor Township, two 21-year-old females from Wilmington, a 21-year-old male from Dover, a 21-year-old female from Upper Marbor, MD, and a 22-year-old female from Brooklyn. One of the 21-year-old females from Wilmington was struck by the driver side door and pinned against a tree. She was flown to Christiana Hospital in critical condition. The vehicle then continued as the driver door broke off, until it struck another tree and came to a stop. At that time, Ligon was removed from the vehicle by several bystanders. Police say Ligon was found to be under the influence of alcohol at the time of the crash and will be charged with 1st Degree Vehicular Assault, 2nd Degree Vehicular Assault (6x), DUI, and No Proof of Insurance. 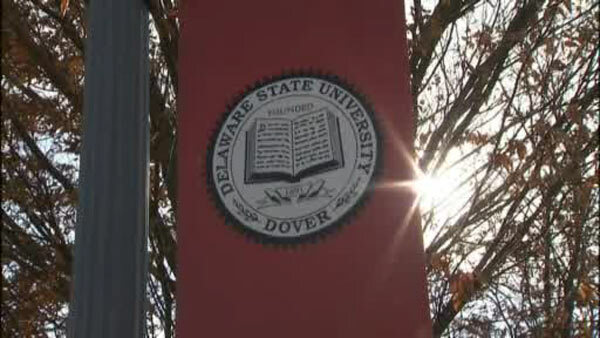 As a result of the incident, Delaware State University canceled all on-campus homecoming activities Saturday night. Due to a serious accident involving a motor vehicle all activities this evening canceled. Non-DSU individuals being directed off-campus. This accident occurred on the same day as four people were killed, including a 2-year-old boy, when a car plowed through a homecoming parade crowd at Oklahoma State University. 44 people in total were injured. Adacia Chambers, a 25-year-old Stillwater resident, was arrested on DUI charges.